To protect your boat Ballistol is the best option. 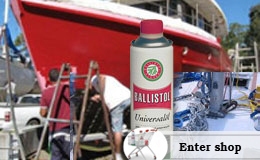 To maintain the deck and inside of the cabins of wooden boats, application of ballistol on regular basis will help. It avoids corrosion and damage caused due to salt water.It called marine protection oil. Ballistol is low in electrical conductivity and is therefore suitable for protecting electrical contacts and it will not attract salt water.